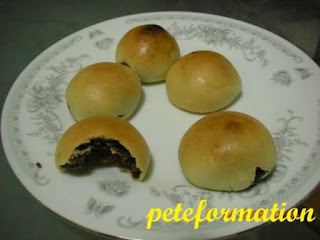 Pong Piah is also known as Roti Timbu in Bahasa Malaysia. 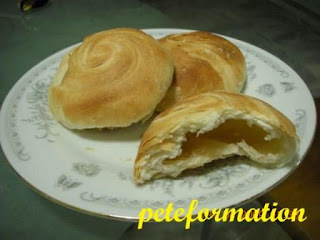 It is almost similar to the Heong Peng but Pong Piah is very much softer and has more flaky texture. It has a creamy sort of taste and the melted sugar filling inside is clearer. The main ingredients for making Pong Piah are wheat flour, sugar, vegetable oil and wheat molasses. My friend, Amy told me that in Penang, for ladies during confinement, they would break a small hole on top of the Pong Piah and pour an egg into the cavity. Then the pong piah is fried slowly in a wok with sesame oil. Mmmmmmm, tasty! At first glance, the Hiau Piah looks like Tambun biscuits (Tau Sar Peng). The difference is that the Hiau Piah has a much harder skins, not flaky and the filling inside is made from brown sugar. It is a little bit too sweet with all the brown sugar filling inside but the aromatic brown sugar gave the Hiau Piah its’ unique taste. This is one of my favourite biscuits too! Wow! These biscuits look yummy!! Calvin : Ha ha, what a coincidence! Cleff : Aiyo, eat must not talk lah! Ha Ha Ha! Foongpc : I love to eat these biscuits! yummy! 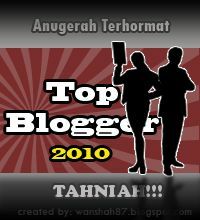 Don't forget to visit Him Heang and Ngee Heang when in Penang. All the good biscuits can be found here. My favouite snacks too!!! Very hard to find hew piah (flat ones with thin layer of filling) these days. My granny used to buy them from KL for me.